I apologize for the short hiatus in my blog. 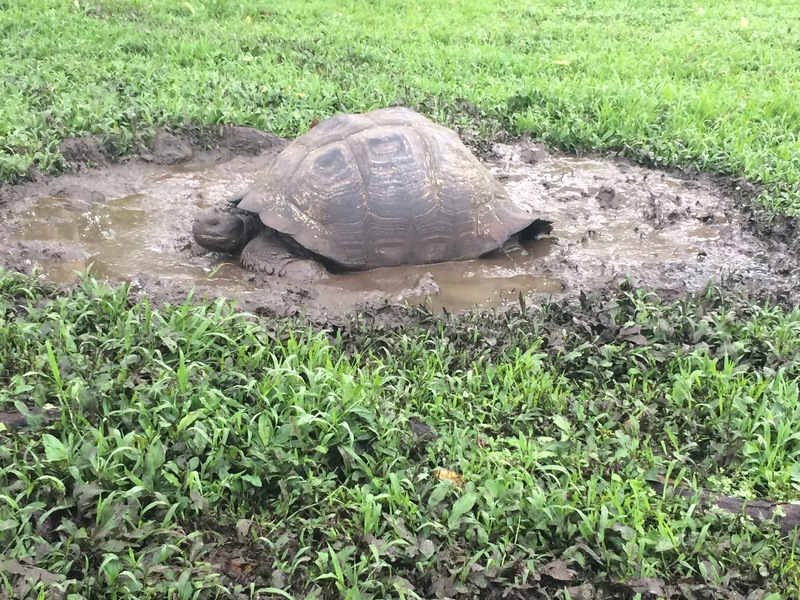 I was in the Galapagos Islands for the past week and service was unavailable. For the past month, I have had October 27th bolded, highlighted and whatever else you can do with a date in my planner. It was always this unattainable date in the future that I could only dream about. Then one day, it came. 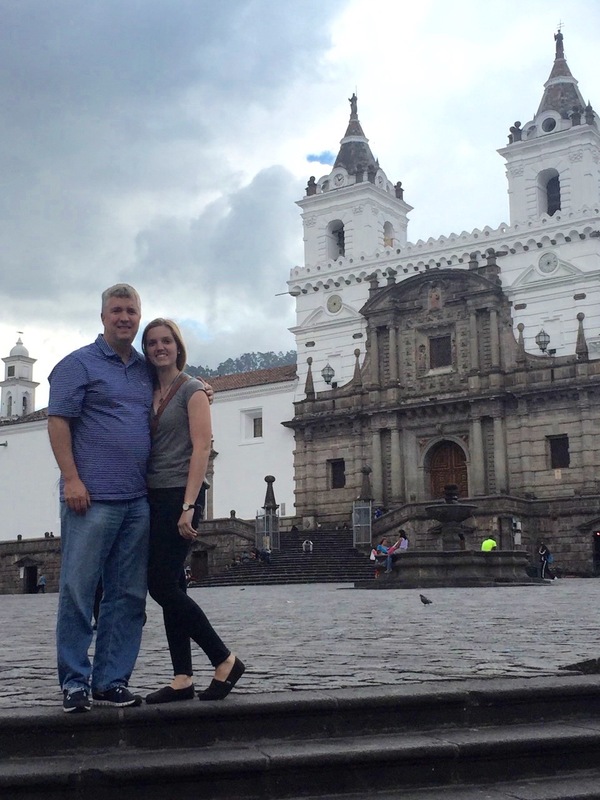 When I saw my parents in Quito, I definitely had to do a double take. I could not believe that they were standing in the city I have called home for the past two and half months. Even though my little brother had passport issues that kept him from coming, I was content knowing he was safe and sound. Unfortunately they became victims of the altitude shock, so we had to take the next day slowly. I was still able to show them around the city, and my heart was full of joy as I was able to play tour guide with them. We visited tourist attractions such as my apartment, and they enjoyed getting to see what daily life it like for me. I took them to other tourist attractions like Plaza Grade, Panecillo and la Iglesia de la Compañía. We drank the traditional colada morada in Plaza San Francisco, and looked forward to our departure for the Galapagos Islands the next day. Last Thursday (29th) we left for the airport ready to set sail. None of us had ever been on a cruise before, so we were a little nervous about how we would fare. I had flashbacks at the airport from my first day here, and I realized how far I had truly come from that day and could not help but feel a little proud of myself. We landed on San Cristobal Island, and the first thing I noticed was how warm, fresh and light the air was. My body had adjusted to the smog-filled, thin air of Quito, so my lungs were happy to take a break. At the dock we were greeted by some of the locals (sea lions) and had to step over them in order to get on our dingy. Once on the boat, we were shown to our cabins, and got ready for our first excursion. We headed back to San Cristobal (dingy-style) and hiked to an overlook. The university I am attending has a branch campus that my roommate from W&J is attending, so I was happy to see all the places she talks to me about. Our cruise is not what you would expect a typical cruise to be. The best way to describe it was a vacation boot camp. We had a wake-up call every morning at 6:45, ate breakfast at 7, and then started our daily adventures. We had two excursions a day: one in the morning and the other in the afternoon. Within these two excursions we did one of two activities: hiking or snorkeling. Before this trip, I had never snorkeled in my life other than in a swimming pool when I was little. After this trip, I would say it is one of my favorite activities. 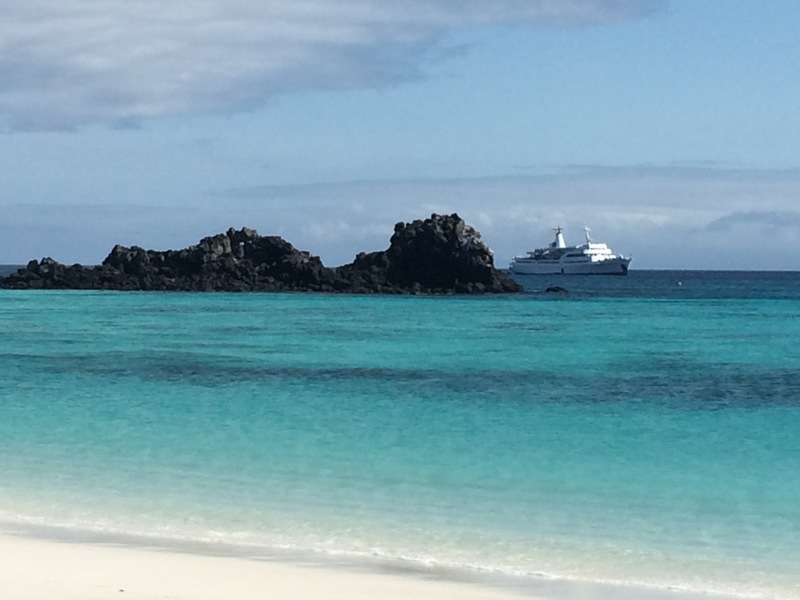 The water in the Galapagos was incredibly clear and incredibly blue. I would grab my snorkel gear and head for the rocks. As I was swimming, sea lions would rush past me and I would often find myself in the middle of a school of fish. At one of our briefings they explained that our next snorkeling session would be for experienced swimmers/snorkelers only. I thought to myself, “I have snorkeled a couple times, I can do it,” So I signed up. Our boat took us out to a rock formation called “Devil’s Crown.” I jumped off the dingy and let the current take me around the rock. The very first things I saw in the water when I put my goggles on were two sharks about 10 feet below me. Everything in me said I should be panicking, but no one else was, so I just enjoyed the view. 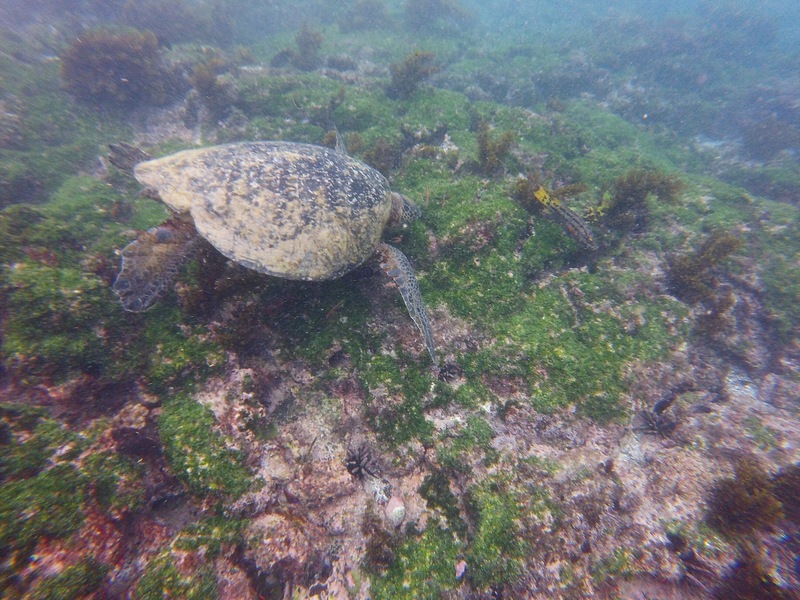 Everything about the Galapagos was amazing. Every island was very different, which offered new sites such as olive sand, blue-footed boobies, alcatrazes, and more. Throughout our trip we were able to go the islands of San Cristobal, Española, Floreana, Santa Cruz and Baltra. One of the highlights of the trip was a hike we completed on Española. The animals had no fear of humans, so we were able to get very close. At the entrance of our trail we encountered a slight problem. 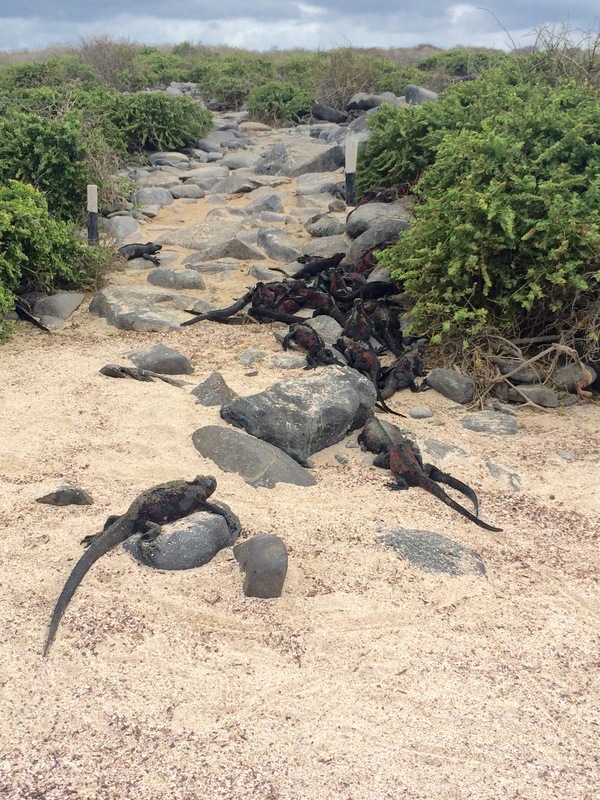 Marine iguanas covered the entire side of the trail. Our tour guide calmly walked past them and said, “Don’t step on the iguanas.” My parents and I looked at each other like, “Why would we ever do that?” But this phrase became the tagline of the hike because the iguanas often blended in with the lava rock, which actually made it possible to accidentally step on one. Luckily none of us did. We were also able to visit a tortoise-breeding farm. Our guide gave us rubber boots and we slushed around in the mud to see these extremely lazy creatures sleep in their beds of mud. It is incredible that no one actually knows how long these turtles live, but the longest recorded one to date lived over 150 years. who wouldn’t like to sleep in a bed of mud? The last two days of our vacation were spent on Santa Cruz Island at Finch Bay hotel. This hotel had a very nice outdoor pool area with beach access as well. We were completely exhausted from our cruise, so we decided to rest and lay by the pool. 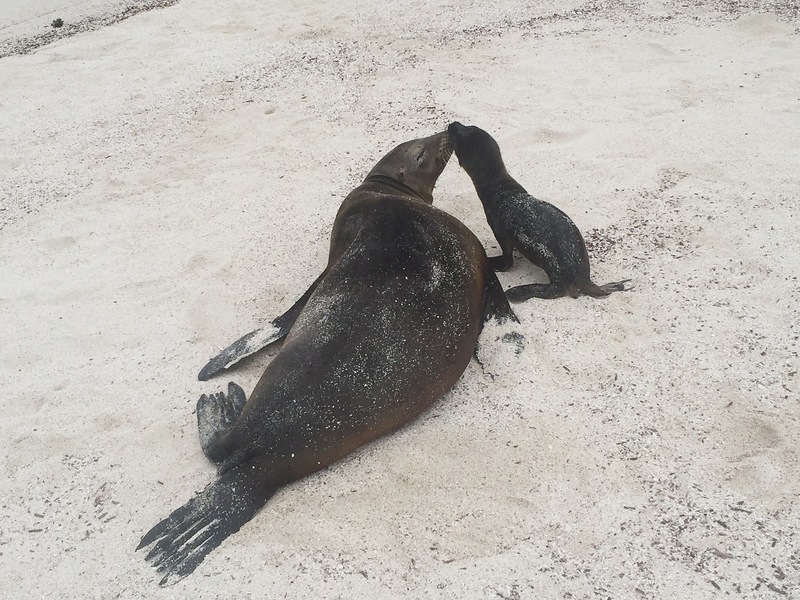 It was a much needed recovery period, and I thoroughly enjoyed soaking up the Galápagos sun with my parents. 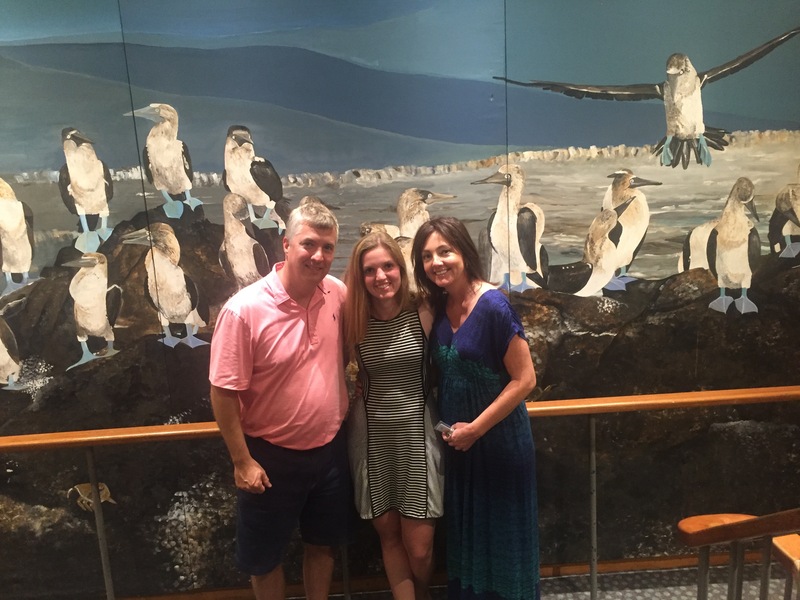 I feel extremely fortunate to have not only seen the Galápagos Islands, but to have done so with my parents. It was great to spend some time with them, but now it is back to “reality.” Like after any vacation it is hard to get back into a routine, but at least I know that this goodbye is only for seven weeks.